The third edition of Dust Present's ELECTRIC FUNERAL FEST will return to Denver, Colorado on June 29th-30th, 2018! The annual South Broadway festival, known loosely as The Blowout on Broadway, will be grander than ever in its third iteration, expanding to include a third stage inside the Mutiny Information Cafe, a spot known city-wide for its welcoming atmosphere and promotion of DIY events of all types. Located across the street from Hi Dive and just a block north of 3 Kings Tavern - the two hosting venues of last year's festival, and two Denver favorites - the Mutiny stage will be the first all-ages stage offered at ELECTRIC FUNERAL FEST and its central location will bolster the street festival environment cultivated over the last two years that's become an integral part of the Electric Funeral's attraction. 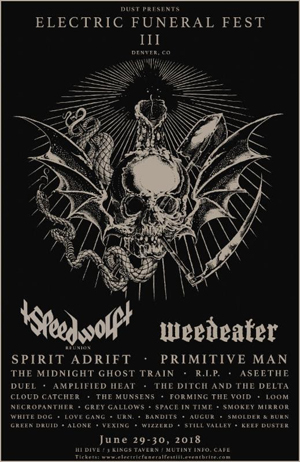 Friday June 29th will mark the one-night return of Denver speed metal legends SPEEDWOLF as the group reunites for their first show in over four years with a headlining slot at 3 Kings. There may be no band in recent memory that's achieved the cult status in Denver that SPEEDWOLF has, and a raucous in-your-face performance inside 3 Kings will surely invoke wild memories (or forgotten ones) of infamous SPEEDWOLF appearances of yore. Friday's support spans from the soaring dual harmonies of 2017 MVPs SPIRIT ADRIFT, crushing Iowa doom trio ASEETHE, the unmatched '70s blues-boogie of AMPLIFIED HEAT, Portland's self-proclaimed street doom merchants R.I.P. and many more. The top slot Saturday June 30th will see the aggressive stoner metal onslaught of Wilmington, North Carolina's WEEDEATER. Driven by the gutteral growl and enthralling stage energy of bassist/vocalist "Dixie" Dave Collins, North Carolina's manic sons are poised to lift the crowd a bit higher than usual. The meat of the day two lineup matches the versatility of day one, including the misanthropic punishment of PRIMITIVE MAN, DUEL's high-flying proto-metal roar, the manic blues attack of THE MIDNIGHT GHOST TRAIN, Opoponax Records sleepers GREY GALLOWS and many more. A full festival lineup will be released in the coming weeks. ELECTRIC FUNERAL is Denver's premiere heavy music festival, built as a bridge between one of North America's most powerful and vibrant cities for heavy music and the legions of bands and fans who visit the Mile High City each year. ELECTRIC FUNERAL, an event run and produced by musicians, stands as the antithesis to corporate driven rock festivals. Founded as a beacon for the Denver scene, ELECTRIC FUNERAL FEST 2018 ramps the spotlight up a little brighter this year, showcasing over fifteen bands from Denver, including a few behemoths holding down headlining and top support slots.